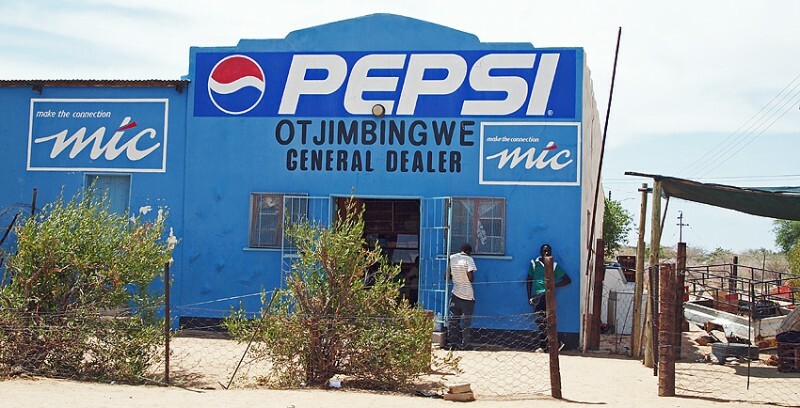 In the middle of nowhere, west of Windhoek is a place called Otjimbingwe. The name probably means “place of refreshment” and the reason is that Otjimbingwe is at the junction of the Swakop and the Omusema rivers so here was a chance to find water. 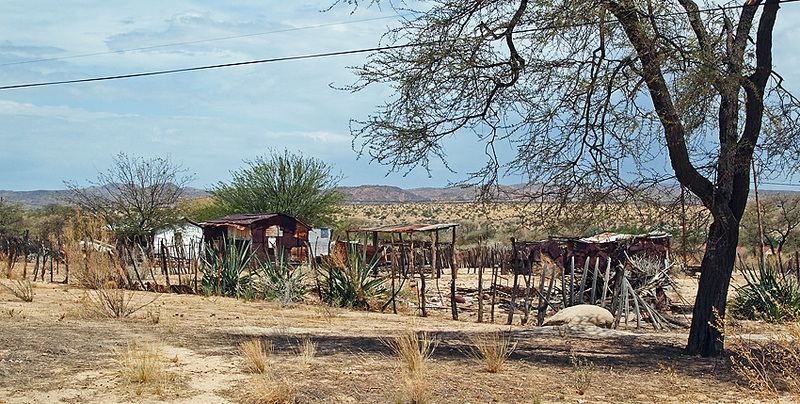 Windhoek had become an important place in 1840 when the powerful Nama chief Jonker Afrikaner settled there, and Otjimbingwe was a good place to rest and get water on the ox-wagon route, half-way between Walvis Bay and Windhoek. In 1849 missionary Johannes Rath and his family settled to make Otjimbingwe a missionary station. 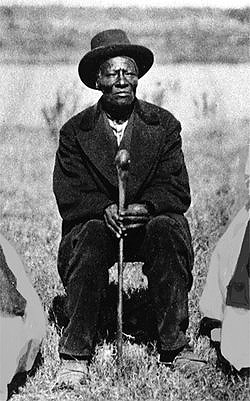 By then a Herero tribe, led by Zeraua, already lived in Otjimbingwe. In 1850 a small church was completed and in 1858 the first of the local Herero’s were baptized. In 1854 the Walvich Bay Mining Company moved their head-quarters to Otjimbingwe. Copper had been found in the highlands nearby but the supply quickly exhausted and already in 1860 the company’s buildings were taken over by the Swedish hunter, explorer and trader Charles John Andersson. Anderson had come to Namibia already in 1850 with Francis Galton and they became the first Europeans to discover Etosha and Ovamboland in 1851. Andersson now established his headquarters and a trading post in Otjimbingwe. This was the first permanent and reliable trading post in the area. The Herero people also made use of the trading station. The leader Zeraua is known as the Herero leader who first armed his people with guns. The relationship between Zeraua and Andersson was very good and Andersson soon became involved in the wars between the Herero and the Nama peoples, on the Herero side. In 1863 Zeraua was supposed to become the supreme Herero leader but declined, leaving the supremacy to Maharero. After a few years Otjimbingwe had turned into a thriving community and in 1864 it was declared an official RHM station. The same year Eduard Hälbich established his Trading Company in Otjimbingwe. 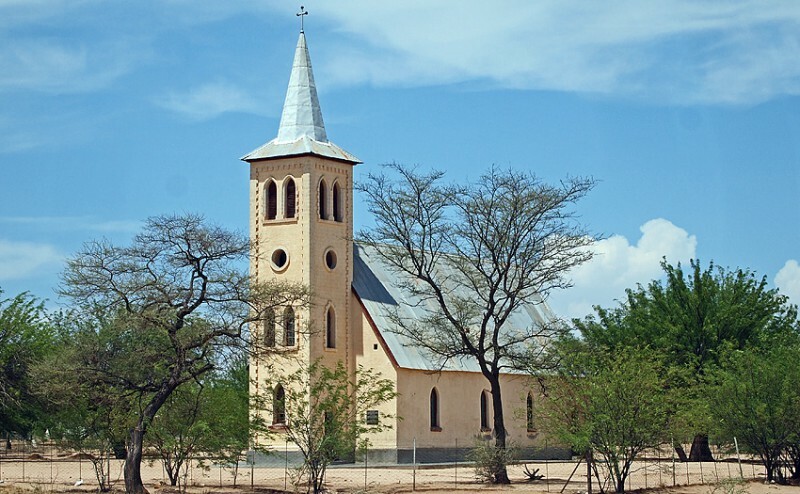 The original church had become too small and in 1865 Hahn laid down the corner stone for a new church that was finished in 1867 using 10 000 bricks made by the Herero people. The architect and building contractor was Eduard Hälbich. Andersson died on a journey to Kunene River in July 1867 and in December that year the Nama, under Jan Jonker Afrikaner and Jakobus Boois, launched a major attack on the Hereros in Otjimbingwe. Again the Europeans stood by the Herero and the church was used as a place of refuge saving many lives. The year 1867 was a very dry year and for that reason Zeraua and his people moved to Omaruru. The church was used for up to four services every Sunday and in different languages; in Nama or Herero, German, English or Afrikaans. During the week the church doubled up as a school. 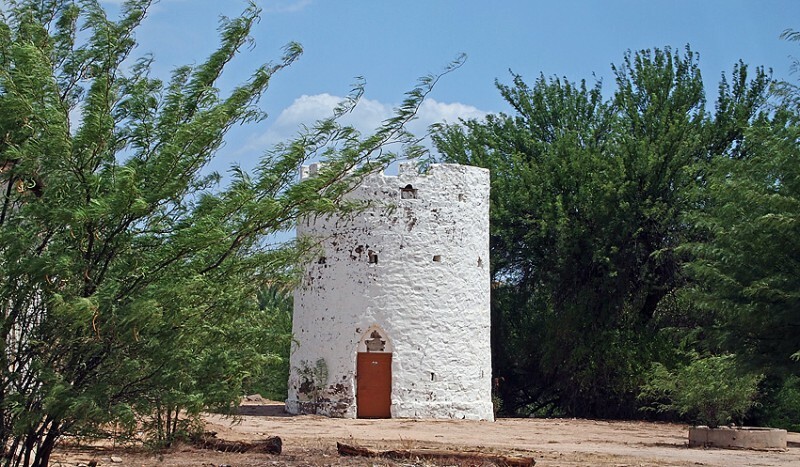 In 1872 a powder magazine, an 8-meter tower, was built, to protect goods during attacks by the Nama. In 1882 it was taken over by the Hälbich trading firm. In 1884, Otjimbingwe was established as the headquarters of Commissioner Dr Heinrich Ernst Göring. By that Otjimbingwe became the administrative centre of the new German colony, its capital city. In 1888 the country’s first post office opened here. In 1890 the new German leader, Curt von François moved his small garrison to Windhoek where a fort was built and in 1892 the administration of German South West Africa was moved to Windhoek. The Hälbich family was however still around. A wind motor was put up in 1896 to generate power to a wagon factory and in 1899 the church got a tower. It collapsed in 1900 but was restored in 1904. Apart from the tower the church today is very much the same as when it was built. It was proclaimed a national monument in 1974. The definite end to the great era of Otjimbingwe came in 1902 when the new railway from Swakopmund to Windhoek was built to bypass Otjimbingwe. Here is a link to a postcard, showing “Fort Otjimbingwe 1902“. Thereafter the city declined. Many residents fell victims to the German genocide war of Herero’s and Nama’s from 1904 to 1908. After the first World War South Africa took over the rule of South West Africa and later apartheid was introduced. In Otjimbingwe the local agriculture was destroyed. and the old town became a place of poverty. 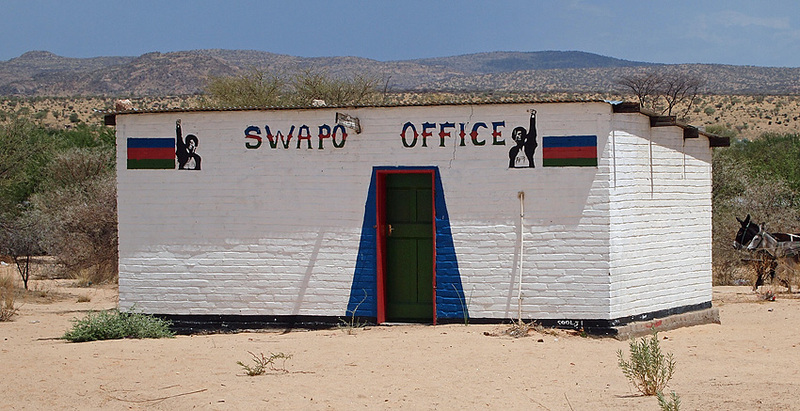 Namibian independence has brought some improved services. Today Otjimbingwe has got water, electricity and communication and health care is available. A local agricultural centre provides information and services to those still willing to try their hand at farming. Jobs, however, remain scarce and for young people the future is not in Otjimbingwe. Today some 8000 people are living in and around Otjimbingwe. Anders, thank you for this post. I’ve been going to Otjimbingwe pretty regularly to help the Lutheran church renovate its hostel for school-age children that sits just a few metres from the old Rhenish Mission Church. Would you and Marie want to come along on my next visit? Thank you Rachel, at least I would love to come along. The photos are from a very short stop and I would like to spend some more time here. Hi Anders, I have looked though all your posts and photos. I really enjoyed it. Many thanks to you and your family. I visited Namibia last year alone (just hired a guide 5 days only for the desert). I would like to visit it again. I’m very happy to know other peoples who also love Namibia. Thank you for this informative post. I visited Otjimbingwe two times this year, in preparation for and then for the commemoration of a meeting called by Zeraeua on 15th June 1863 for all the “Herero” people. During that time, there was constant threat from the Nama people. This meeting might have been highly influenced by Anderson. Thanks, that is interesting. From books written those days you get the impressions that the realtions between Zeraua and the Swedes were very good. I’m an American Peace Corps volunteer currently teaching in Otjimbingwe. I just stumbled upon this site and was happy and surprised to read that my village gets the occasional international visitor! It’s a very nice overview of the village and its history. Thanks Ethan, you are teaching in an interesting place! Nice photos and interesting facts! Thanks Burkhart! My full contacts,i would love to know if there are some interest in the material of otjimbingwe as trading place(1800) ,some pieces of interest,collection (e.g. coins,plates an extra? I’m sure there is but I don’t know where to go. Hi Anders , please get in touch with me at this email adress, kornelia.malima@yahoo.com it is regarding Charles Andersson . Thank you Anders. I think people need to be taught about Charles Andersson . Am very happy that people haven’t forgotten about him. His legacy shall leave forever. My dad had a farm near Otjimbingwe. During 1974 he sold my old university car to somebody in Otjimbingwe. It was a model 1954 Chev De Lux. (Yellow with registration number SW 4789) . I would love to locate this old friend of mine to restore her to her previous glory. Unfortunately I cannot post a photo here, but can sent it to anybody interested in helping me.